Healthcare’s value-based purchasing increasingly favors a population-centric approach to health management, identifying risk across the care continuum. To control costs, healthcare organizations and employers are turning to population health management (PHM), defined as the management of integration and outcome measurements of any program affecting the health and productivity of a specific population or group. Surveying patients regularly about their experience and using electronic medical records are just a few PHM strategies. 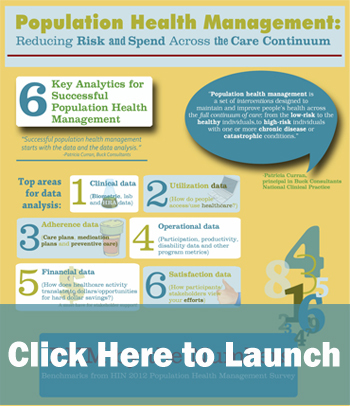 This new infographic from the Healthcare Intelligence Network outlines key analytics, barriers, tools and workflows to ensure successful management of specific populations, drawing from responses from our 2012 Population Health Management survey. Ideas for successful PHM, including face-to-face management with immediate referral from health center providers. We invite you to embed this infographic on your own Web site using the code that appears beneath it. Also, share it via your social media channels. A deeper dive into the latest trends in PHM is reflected in 2012 Healthcare Benchmarks: Population Health Management. This entry was posted on Tuesday, January 22nd, 2013 at 1:30 pm	and is filed under Disease Management, Electronic Medical Record, Healthcare Costs, Infographics, Patient Satisfaction, Population Health Management. You can follow any responses to this entry through the RSS 2.0 feed. Both comments and pings are currently closed.